Wolf Erlbruch tonight received the Astrid Lindgren Memorial Award from H.R.H. Crown Princess Victoria. Swedish Minister of Culture and Democracy, Mrs Alice Bah Kuhnke, gave a speech in honour of the laureate. During the evening, musical entertainment was provided by Swedish opera singer Rickard Söderberg and the Sami artist Sofia Jannok. A dance adaption of Wolf Erlbruch’s book Duck, Death and the Tulip was performed by Fredrik Quiňones and Stacey Aung, choreographed by Mari Carrasco. The ceremony was hosted by Yukiko Duke, journalist and critic. Apart from the prize sum, 5 million SEK, the laureate received a diploma illustrated by Marcus-Gunnar Pettersson and Maja K Zetterberg. “Being an illustrator, means you never work without a given text. To start reading a new manuscript is like entering a foreign country. You know nobody.” said Wolf Erlbruch in is acceptance speech. He won the audience’s heart by loosing his glasses before starting to speak. Erlbruch also mentioned the difficulties of sometimes finding the right pictures. “Some texts more or less illustrate themselves. Then there is poetry, which is impossible to translate.” said Wolf Erlbruch before finishing his speech by reciting from his favourite poem by Seamus Heaney. Born in 1948, is a German illustrator and picturebook author. He has written some ten books of his own and illustrated nearly fifty titles by other authors. He is best known for his illustrations of The Story of the Little Mole Who Knew It Was None of His Business (1994), which became a great success around the world. Yukiko Duke is a book reviewer for the television program Gomorron Sverige, editor of the magazine Vi läser, and herself an author and a translator. Tonight, on 29 May, she will host the award ceremony for ALMA laureate Wolf Erlbruch. We caught up with her to ask a few questions. What is your earliest memory of reading? Wow, I have a lot. Mostly Japanese books, I’m afraid, because my mother, who used to read me bedtime stories, was Japanese, and she chose Japanese books to keep the language alive for me. But I remember Saint-Exupéry’s The Little Prince very well, because I thought it was so odd –　so sad and still so light, all at the same time. What is your favorite book by Wolf Erlbruch, and why? The one that most stands out for me is Duck, Death and the Tulip. It is the most beautiful and most dignified book about dying I have ever read, in any genre. I can’t count the number of copies I’ve given to people – both children and adults. It’s always interesting to hear your book recommendations for Gomorron Sverige on Swedish public television. How do you choose books for the show? Gomorron Sverige is a news show, so the basic criterion is that the first reviews should have been scheduled for that week or the week before. Apart from that, it’s up to me. Since the news desk likes to pick up nonfiction books anyway, I usually concentrate on fiction. I try to choose books that deserve to be reviewed but don’t always get the major reviews in the big papers. When and where do you like to read? What’s on your bedside table right now? Hm. A lot of different books, actually. The latest book by the Swedish artist Lars Lerin, Och fågeln flög fritt för att uppsöka sin bur, which is a set of illustrated reflections on his life. The English critic Olivia Laing’s volume of essays, The Lonely City, about being alone in New York. And the second book in Madeleine Bäck’s fantasy/horror series about mysterious happenings in a small community in Gästrikland, in eastern Sweden. You review and translate other people’s books and also write your own. What role suits you best? What are the hardest and the most fun parts? Let me quote the Japanese author Haruki Murakami: “I’m a farmer with diversified crops.” I like working with language in general. I enjoy reading, formulating my thoughts about reading and writing in book reviews, and moving written material from one language to another. All of these ways of rubbing up against words and language have their charm. What kind of future do you see for children’s books, as children spend more and more time on tablets and other screens? I think we shouldn’t get hung up on the forms in which literature is disseminated. All people, grown-ups and kids alike, will always need stories. Telling stories to ourselves and each other is our way of explaining the world and making sense of life. Have children’s books in digital form, alongside books with bindings, won’t change that in the slightest. Nor do I think that people, either children or adults, will stop reading. They might read in different ways, but they won’t stop. You’ve said in interviews that you want to be a cultural bridge between Japan and Sweden. How are you doing that? I translate Japanese fiction into Swedish, and I write about Japan in Sweden and vice versa. Once a month I go on nighttime radio for the Japanese public broadcaster NHK and talk about Sweden. I also give a lot of lectures about Japan. Right now I’m working on a seminar series about Japanese culture to celebrate the 150th anniversary of diplomatic relations between Sweden and Japan. Tell us – what have you got coming up? At the moment my mother and I are putting the finishing touches on our latest project, a translation of Murakami’s essays about writing. They are funny, rather philosophical pieces about what makes a writer a writer and ways to work with narrative. Follow the award ceremony live! Join us tonight when Wolf Erlbruch recieves the 2017 Astrid Lindgren Memorial Award (ALMA) in a ceremony at the Stockholm Concert Hall on May 29! The award ceremony is broadcasted live at alma.se and on our Facebook-page. The live broadcast starts at app. 5.50 pm CET. The ceremony takes place at 6-7 pm CET Monday May 29. The award is presented by H.R.H. 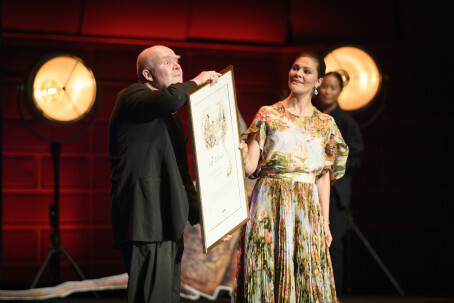 Crown Princess Victoria at a ceremony at the Stockholm Concert Hall, attended by Alice Bah Kuhnke, Swedish Minister for Culture and Democracy who is giving a speech in honor of Wolf Erlbruch. The compere for the evening is the journalist and literary critic Mrs. Yukiko Duke. There will be artist performances and presentations of Wolf Erlbruch’s work. On Tuesday morning it was time for Wolf Erlbruch to visit Hjulsta Elementary School and meet all the enthusiastic and curious students and teachers there. We had a great time! First he met a group of seventh graders who had read his “Duck, Death and the Tulip” and made their own interpretations of the book in drawing lessons. The had also prepared questions. – Why did you want to write a book about death? one of the students asked. – I wanted to show death as something kind, not just a scary murderer which is the way we often think of it. This particular death that you meet in the book is nice to talk to and answers questions as well, Wolf Erlbruch said. – But really, why do you think so much about death? Because I don’t! a thirteen-year-old girl said. – At my age, you tend to do so. And I don’t really think it is such a bad thing to think about death every now and then, to get used to the idea. Small children think about it very often and have many questions. Time to move on; some 150 primary school children where waiting in the the school gymnasium and we were invited to watch some wonderful ALMA inspired entertainment. They cheered and applauded as Wolf Erlbruch entered! A group of third graders performed their own, fantastic dance piece to the song “Du käre lille snickerbo” from Astrid Lindgren’s famous “Emil of Lönneberga”. Wolf Erlbruch also shared his thoughts with the children and among other things, he told them that he finds the father character very interesting. Take a closer look at the pictures, are you able to find the father of Emil? – What do you think about Astrid Lindgren? wondered one of the children. – I just love her! Wolf quickly replied. To get a feeling of what it was like to be in Hjulsta, have a look at the beautiful pictures taken by photographer Stefan Tell. Wolf Erlbruch is in Sweden! Wolf Erlbruch is in Sweden! Yesterday he met Swedish journalists and gave interviews all day long. He is overwhelmed with all the attention that comes with receiving one of the worlds largest literature awards, and who would’nt be? Tonight at 6-7 pm he will be at Kulturhuset Stadsteatern to show the audience some of his unique Pictures which are so far unpublished, among others his first drawings as a 2 year old boy. The event takes place in “Hörsalen” and is open to the public and free of charge. Warmly welcome! Earlier this morning he went to visit students at Hjulsta Elementary school where he was honoured and treated as a superstar. You will be able to hear more about the visit in the next post. Pictures taken at Skeppsholmen in Stockholm by photographer Stefan Tell. For the fourth year running, the Astrid Lindgren Memorial Award is our school-wide spring theme here at Hjulsta Elementary. Teachers, staff and students ages 6–16 have been reading, discussing and getting inspired by the ALMA laureates and Astrid Lindgren herself. Not for the last time, I’m sure! As part of our ALMA theme, we always spend a lot of time on Astrid Lindgren. Many of our students are new immigrants to Sweden, and nearly all of them have parents born in another country. For anyone attending school in Sweden, we think Astrid Lindgren is required reading. Astrid’s characters, her language, Swedish life in the olden days – all these are things that every Swede has a relationship to. Reading Astrid’s books, and watching the first-rate films that have been based on them, unlocks an important piece of our shared cultural heritage for our students. Reading books by the ALMA laureates also helps us see what life can be like under very different circumstances. The ALMA books introduce us to people from all over the world and from throughout history. For example, when PRAESA was recognized a few years ago, we had the chance to learn a great deal about life in South Africa. Often we grown-ups are surprised by how powerfully our students respond to the ALMA books. The Swedish government instituted the award to recognize authors and illustrators whose work is “of the highest artistic quality and conveys the deeply humanist spirit associated with Astrid Lindgren.” Obviously, “highest artistic quality” will always be somewhat subjective, but we can tell there is something special about these books. We fall in love with them; they challenge us; above all, they get us talking. And when we think and talk about different interpretations, we grow in wisdom together. This is a joyful process – it is exhilarating to realize the importance of our thoughts, and how smart we really are when we try. And I think our ALMA theme has made us grown-ups a little braver. We have learned that books we thought might be too difficult or too “out there” can lead to very exciting discussions. This spring, many of our groups were deeply affected by reading Wolf Erlbruch’s Duck, Death and the Tulip. The book led us to talk about death and how sad it is to lose the people we love, but also about how a person reaching the end of their life can be a perfectly natural thing. We also read Leonard: we laughed at the pictures, congratulated ourselves on discovering clues to the plot, and some of our students wrote their own stories and drew pictures of the things they are most afraid of. Many of the ALMA laureates take up difficult subjects in their books. Depression – death – loneliness – sad things that are not easy to talk about. We read about them and process them together, through conversation and our own creative activities. Sometimes the authors joke about the very hardest questions. But it is always done in the spirit of Astrid Lindgren, with respect for people who facing different life challenges and with optimism that difficulties can be overcome. Many of the books by the ALMA laureates are fairly quick reads and invite a real range of interpretations. The numerous picture books work well for readers of all ages. Some of our teachers and staff like to return to the same books over and over with different student groups. We never get bored, and we learn more each time from our students’ reflections. But with such a wealth of literature, if we want to try something new there is always another book to explore. We hope and believe that our ALMA theme has helped other schools throughout Sweden learn more about the Astrid Lindgren Memorial Award and its laureates. In the hopes of inspiring others, we have been documenting our work on our website: www.världensalma.se. 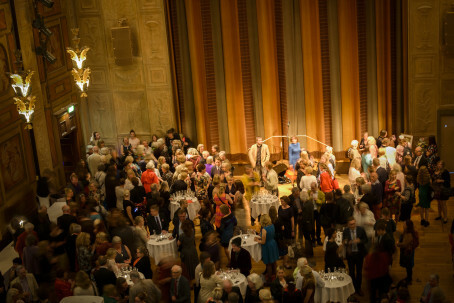 The Astrid Lindgren Memorial Award opens the door to a literary treasure chamber. We hope that many other schools around the world will seek out the treasure and have reading experiences as fantastic as ours! Welcome to cover the award ceremony of the Astrid Lindgren Memorial Award 2017, to be presented the German Illustrator Wolf Erlbruch. The award is presented by H.R.H. Crown Princess Victoria at a ceremony at the Stockholm Concert Hall on Monday 29 May 2017 attended by Alice Bah Kuhnke, Swedish Minister for Culture and Democracy who is giving a speech in honor of Wolf Erlbruch. The compere for the evening is the journalist and literary critic Mrs. Yukiko Duke. There will be artist performances and presentations of Wolf Erlbruch’s work. The prize diploma is designed by Swedish illustrator Marcus Gunnar Pettersson. Wolf Erlbruch, born in 1948, has written some ten books of his own and illustrated nearly fifty titles by other authors. He is best known for his illustrations of The Story of the Little Mole Who Knew It Was None of His Business (1994) and Duck, Death and the Tulip (2008), which both became a great success around the world. Mariella Kucer, mariella.kucer@alma.se +46 (0)76-5401017. Press images and video content in broadcast quality with highlights and soundbites from the award ceremony will be available at the ALMA newsroom during the evening. The German illustrator and picturebook author Wolf Erlbruch is coming to Sweden to receive the 2017 Astrid Lindgren Memorial Award (ALMA) and to give a public lecture. The award is presented by H.R.H. Crown Princess Victoria at a ceremony at the Stockholm Concert Hall on 29 May 2017 attended by Alice Bah Kuhnke, Swedish Minister for Culture and Democracy who is giving a speech in honor of Erlbruch. – Wolf Erlbruch approaches the big life issues with warmth and humour and makes them easy to understand for the youngest readers. He is truly a worthy laureate of the Astrid Lindgren Memorial Award, the world’s largest literary children’s literature prize. It is a great honor and joy for me to lead the celebration of this wonderful author and illustrator. On May 23 at 6 pm, Wolf Erlbruch meets the readers in a lecture at Kulturhuset Stadsteatern in Stockholm. The event is open to the public and free of charge. The program for the visit in Sweden also includes meetings with children and young adults at Hjulsta grundskola and the German school in Stockholm as well as a visit to Astrid Lindgren’s childhood home Näs in Vimmerby. “Oh dear, oh dear” was Erlbruchs’s reaction when Jury Chairman Boel Westin on April 4 informed the German illustrator that he is the laureate of the world’s largest award for children’s and young adult literature. The choice of Wolf Erlbruch has been honored around the world and has had a great deal of media impact in Sweden and abroad. Wolf Erlbruch, born in 1948, has written some ten books of his own and illustrated nearly fifty titles by other authors. He is best known for his illustrations of The Story of the Little Mole Who Knew It Was None of His Business (1994), which became a great success around the world.